It was a moment that would go down in history, serving as a watershed moment for the discovery of Earth-like planets. Kepler 452 is a Sun-like star that wanders through the cosmos 1,400 light-years from Earth. It has the same surface temperature as our Sun and nearly the exact same energy output. Ultimately, both the Sun and Kepler 452 areG-typee yellow dwarfs. This means that Kepler 452’s habitability zone (the area surrounding a star in which liquid water could theoretically exist) is nearly identical to the Sun’s and if that’s not enough, there’s a planet that orbits in a path that is nearly identical to Earth’s—it falls in almost the exact same place as Earth does in our own solar system. Notably, Earth and Kepler 452b don’t just share orbits—they are twins in a plethora of other ways. 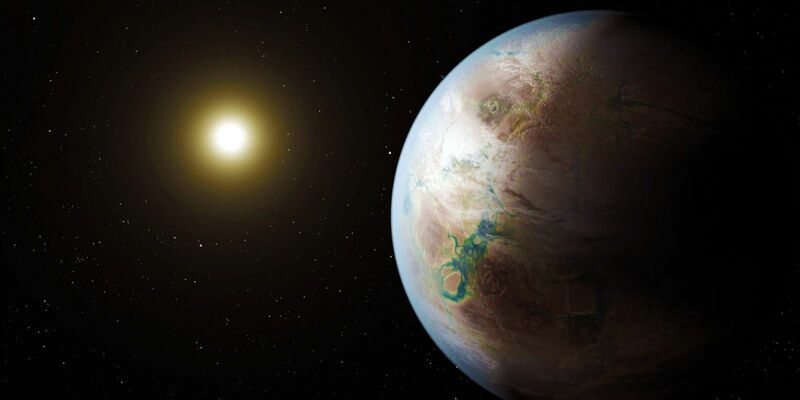 Scientists can’t measure the mass of Kepler-452b directly, but inferences based on modeling indicate that the planet is just five times as massive as the Earth (nearly 60% larger). That strongly indicates that this is a rocky world like our own, which is a very good thing (as we really don’t have the technology to live on gas giants). Moreover, although five times the mass might seem like an awful lot, scientists estimate that Kepler 452b only has twice the gravity of Earth. Again, this makes habitability possible and that’s not entirely all. Kepler 452 is a little slightly older than our own sun. As such, scientists assert that Kepler 452b is a little older than Earth. This means that the planet has been in its star’s habitability zone for some 6 billion years. This is longer than Earth has been in the habitability zone of the sun and (obviously) more than enough time for advanced life forms to evolve. And of course, the last sentence is key. We won’t know exactly what the conditions are like until we manage to get there. Keep in mind that Mars also falls inside our Sun’s habitability zone, and it is a barren, desolate world. However, this find is still amazing, as probability indicates that, if we managed to find one Earth-like world after just a few years of searching, it is likely that there are a plethora more waiting to be found (remember, it is far harder to find smaller planets. Gas giants are much easier to locate). Indeed, since the discovery of this world almost two years ago, scientists have found dozens of Earth-like worlds. In fact, they found an entire solar system of planets that are similar to our own. And with the James Webb—a telescope that is 100 times more powerful than Hubble—set to launch in 2018…we’re really just getting started.